We gathered around the blind Shaykh who sits in a less lit corner of this ancient mosque set in a town not pointed out even in the modern European maps. How could in this age of powerful satellite and global positioning system, such town can remain unmapped is a mystery. Though the Shaykh is blind, his face has an aura that guided our heart almost collectively to come and sit near him. We are a band of four, losing our way came upon this town in southern Morocco. The scorching summer at the desert of North Africa is almost equally unbearable for all of us, whether we are Indian or European. The discovery of the mosque, its pool of crystal clear cool water and its shade was like an heavenly oasis for us. Its time between midday and afternoon prayer. There are only few people present in the mosque except the blind Shaykh sitting at the back. We travelers prayed together and then without saying a word to each other, we all came and sit near this Shaykh. 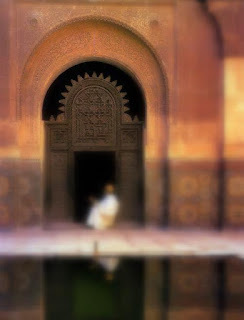 I remember I was told by a teacher of the Path, if you go to a mosque in an unknown mosque, you should always look out carefully for someone sitting in the back or in some lonely corner, who is not speaking to others but immersed either in remembrance through zik or sitting in pure contemplation. Sit near that person, you will receive treasure, and perchance you may even come across Khidr, the hidden immortal guide of the soul. We convey our greetings of peace to the blind Shaykh and in reply he turns, to my astonishment towards the direction of each of us separately and accurately and greeted us with a more elevated greetings. 'He certainly has a very sharp sense of direction', I thought to myself. And the first thing he speaks is a response to this innermost thought of mine. "Working for twenty seven years as a head teacher in a class full of students, Allah has gifted me with a sense of direction and I praise is due to Him in every state." Unintentionally I think again, 'It is said that one of the signs of Awliya Allah (intimate friends of God) is that they can see with the vision of their hearts and innermost thoughts are made known to them' and my lips utters, "Mashallah Sidi!" on this. And the Shaykh seemed to read my thought again, but remained silent for a while. In a prolonged fashioned he pronounced, "Allaah!" with a deep sigh coming from his inside. Among us, Ian who came into the Sufi Path earlier than any of us and has more command over spoken local Arabic, starts the real conversation with this elderly, venerable man who surely has something special about him. I am trying to remember from my memory as much as I can from that strange summer afternoon. Ian whose Sufi name is Yusuf introduce himself and rest three of us. The Shaykh welcomes us all in this town and also in the mosque. He says that he is the custodian of this ancient mosque, which according to oral history, was established by few of the earlier companion of the Last Prophet, blessings on him. Then the Shaykh asks us about where we are coming from and how long do we intend to stay in the town. If necessary he could arrange some guest house to stay. But we thank him and tell him that we are on the move and ask him direction towards our next destination in the journey, which he conveys to us in the most helpful way. He surely know this land like the palm of his hand or even better. Realizing that we should part soon, again almost without me thinking about it, my tongue moved. I spoke in my broken Arabic, "Grandfather, please give us some advice." The Shaykh smiled, perhaps because I addressed him as my Grandfather. His was a face of a very senior man which has faced the desert for many moons. His age could be anything between 75 to 90, hard to tell. There were many wrinkles on the face, yet the smile that I saw, was like an innocent child. The Shaykh again one by one glance upon our faces without looking at us, but probably looking through his heart. And then he said in a soft voice and I remember this part very clearly because to all of our surprise he started to speak, for the first and the last time, in fluent English. "Beautiful children! You asked for advice to this old man who is waiting for his return call from his Lord, and this poor man still blush like a newly wed bride when I think of meeting my guide in the hereafter, and feel nothing but abject poverty in the thought of meeting Rasulullah, sallalahu alaihi wa sallam and my heart would stop beating if I contemplate enough of how would I meet my Creator." Tears roll down from her invisible eyes. "So that is my state and I do not know how sincere will be my advice." He now closes his eyes, head bowing down towards his lap and from where I know not, a very cooling breeze suddenly enters the mosque and touches us. Very strange I thought, because outside its plain scorching summer sun. I surrender to my ignorance about deserts way of things. Touched by the same cool breeze, the Shaykh again look up, his face is lit, as if there is a smile appearing on his forehead. I suddenly had a feeling that this old man receives divine revelation in a way we barely can comprehend and this cool breeze was a sign for him. Now looking up, the Shaykh again begin to speak. "My dear children, this is what came to this old man. All the limbs in our Adamic body of clay and water that we are gifted by our Creator, are gifted as a sacred trust. Each and every soul breathed into the body of the children of Adam must come to taste death and each shall be resurrected to meet their Maker, their Lord, Lord of the Worlds. 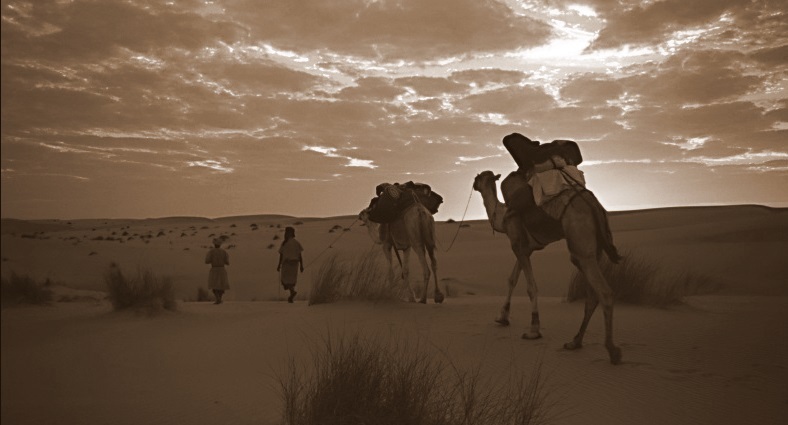 We are all journeying, some knowingly, some in sheer ignorance, to meet the Lord. The One who created us all, makes us journey back to Him. Have shame now on contemplating whether we are doing our sacred trusts their due justice, before a Day comes when there will be no more opening for turning away, neither will any ransom be accepted, even if one would like to exchange the whole world for it. Then he recited the verse from the Quran, "Indeed, the hearing, the sight and the heart - about all those one will be questioned." Whenever our eyes are made to fall upon someone who is in distress, know that God is speaking to you in that glance. It could a friend in need, it could be a colleague in distress. If you see someone in the street, a homeless, a beggar who is clearly without food, without basic needs, hear what God is speaking to you. If you have money in your pocket, buy some food and offer it to that person in need. That is what is demanded of us and that is an act which will do justice to our eyes, our heart and our limbs. All the gifts that our Lord has bestowed upon us is best appreciated when we give to others, instead of just taking for us. Every time we act to give, we are raised one station higher from other creatures on earth to our real station preserved in the Paradise with our Lord. And that is enough. Please remember to listen to God whenever your eyes are made to fall upon someone who is in distress." Joshua, my brother speaks now. He says, "Since we have to start soon, may we pray behind you Sidi for our Asr prayer. We would be most honored if we could pray behind you. Perhaps Allah will answer your dua for us. At this the old man feel shy once again, perhaps because we praised him and all he wants is to be a dust in his humility. Now Ian also makes a request in Arabic and I also add, "Grandfather, it would be a wonderful gift for us in our journey." This moves him. He asks us to make ablution, to wash ourselves before we stand for prayer. He also comes to the water pool and makes ablution, which I had the chance to observe sitting nearby and I have hardly seen anyone doing ablution in such perfect and sincere manner. Every movement of water upon every limbs was like an act of prayer and thanksgiving for him. I feel grateful to Allah for bringing us to this unexpected place and teaching us many things in such short span of time. Like freshly baptized from the river jordan, we all do ablution at the water reservoir of the mosque. The coolness of the water reaches to the core of our being. We join behind the old man, in rank, shoulder to shoulder. The Shaykh has one of the most amazing voice, brings tears to my eyes. I can hear someone else is sobbing too in the oozing sincereity of his voice that is so other worldly. We stay in bowing and in prostration much longer than normal. The Shaykh took us to placeless places, into timelessness. Finally when he says salaam on the right side and on the left side, we are brought back to our earthly place, our earthly time. "There are servants of Allah on this earth, who when prostrate before their Lord, all who pray behind him, is forgiven in an instant." - I suddenly remember my teacher's saying and hope that the person behind whom we just prayed be one of such beloved of Allah. Then he raises his hand and supplicate beautifully in English for our safe journey, for blessing in our path and in the journey of this life and beyond. We say ameen in unison. After than the old man turn to us and says sweetly "As Salamu Alikum wa Rahmatullah and may Allah bless your journey my children." He bade us good bye with a bright, radiant face and hopefully, perhaps we are returning with our faces and our hearts having more noor (divine light) than before we entered into this desert town. We are lit with mysterious light from within and without - in the presence of those who are nearer to that divine presence. After thay meeting, many moons have passed. But one thing stayed with me, is his brief advice. And now in my fleeting days every time my eyes fall on someone at the roadside, some beggar, homeless, one without proper clothes, a friend or a colleague who would relate his or her problem, I pay attention to hear God's voice. At that moment, that old Shaykh's voice and God's voice I can hardly separate.